How to protect your documents with a password? If you are going to send your files by e-mail or post them on the web you can encrypt your documents with a password to prevent unauthorized access. 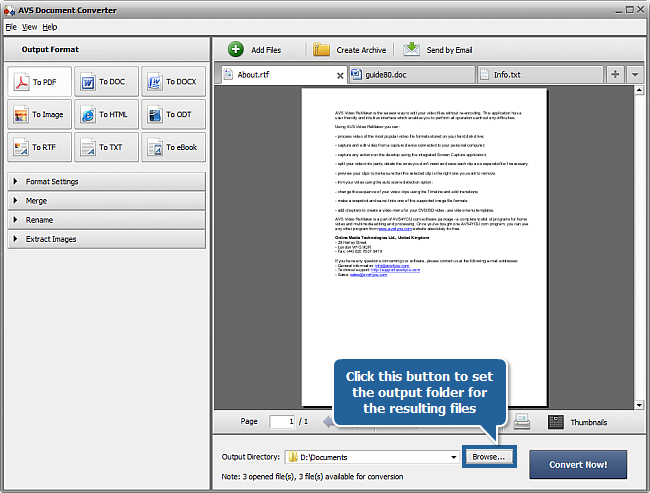 You can maintain your electronic documents confidentiality using AVS Document Converter. It also lets you protect your files from modifying, printing or copying information. Click here to download it. After the download is finished, run the AVSDocumentConverter.exe file and follow the installation wizard instructions. 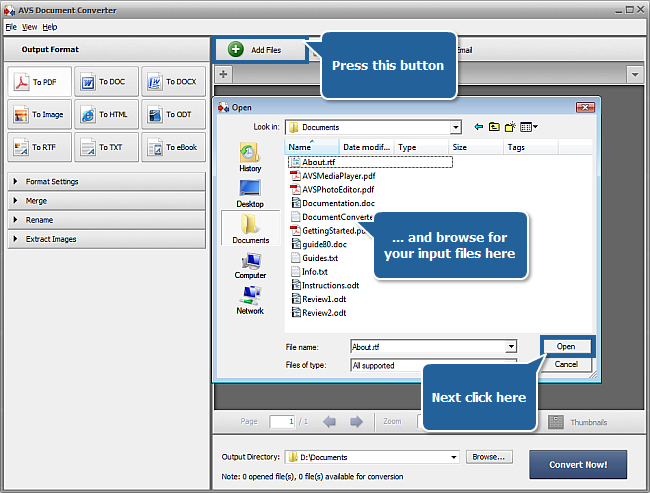 To load files which you would like to convert click the Add Files button on the top of the program window. In the opened Windows Explorer window select the needed files and press the Open button. 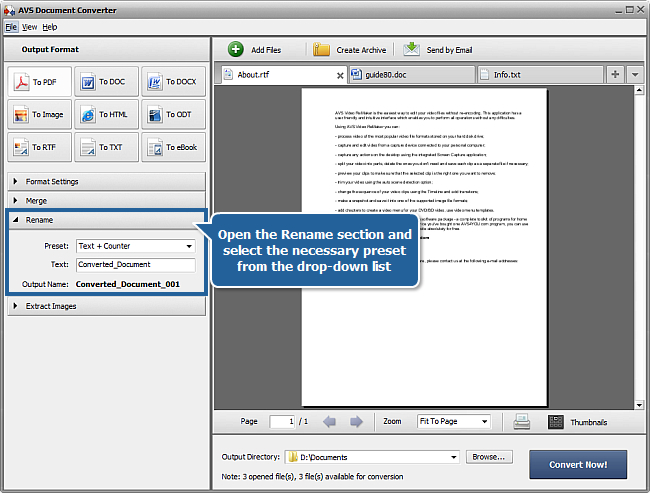 After the selected documents are imported into the program you will be able to view them in the Preview Area. To navigate between them use the tabs above the Preview Area. To be able to protect your documents with a password you must select the PDF output format. Press the appropriate button at the Output Format section of the Working Area. Open the Format Settings section in the Working Area by clicking the black arrow near it. Check the Permissions check-box to enable password security for all the documents loaded to the program. Set passwords for your documents. Type the owner password in the Owner field. This password will provide you with a complete access to your documents. Type the user password in the User field (this password must differ from the owner password). To open password protected documents users will have to enter this password. You can also restrict usage of your content by users. To disable certain operations on protected documents check one or a number of options from the Restrict field. 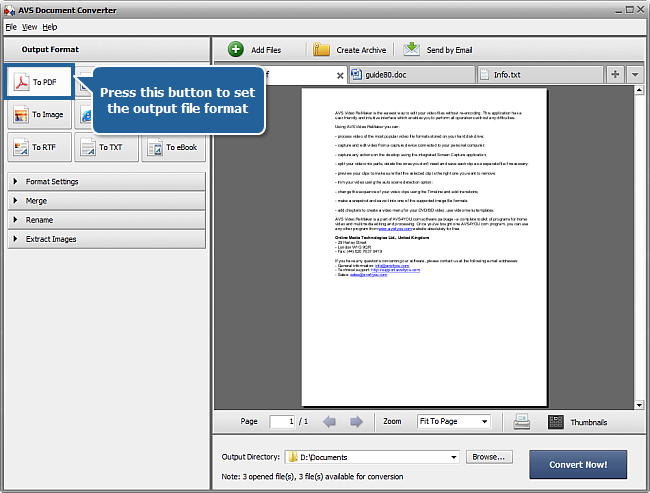 It is possible to disable Editing, Printing and Copying content of your files. Note: to set usage restrictions you have to set the Owner and User passwords at first. If you want to disable password protection before converting documents uncheck the Permissions check-box. Open the Rename section of the Working Area and select one of the available presets from the Preset drop-down list. You can preserve the Original name or select the Text + Counter or Counter + Text preset to type your own name in the Text field. The resulting name will be composed of your text and a file sequence number. Click the Browse... button next to the Output Directory field in the Output File Area and select the folder where you would like to save your converted files. 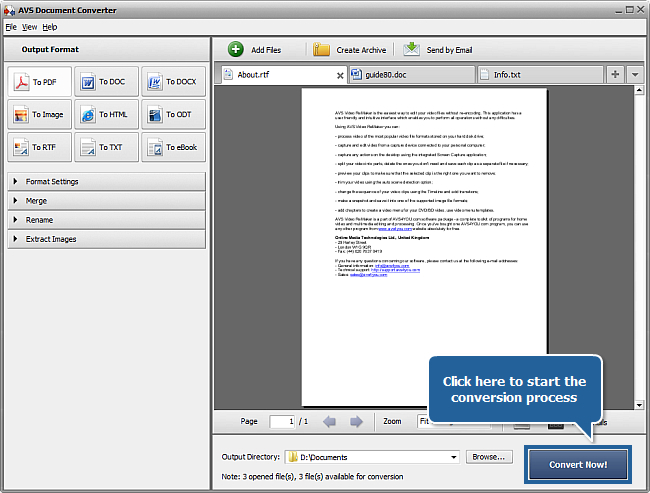 To start the conversion process press the Convert Now! button in the right bottom corner of the program window. You will see the overall progress on the progress bar in the center of the Preview Area. Now you can press the Open folder button and use your protected documents on the web without any fear of unwanted access.